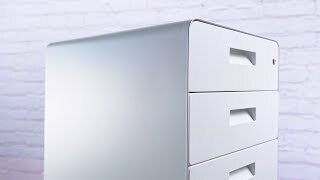 Store, lock, and roll your way to a more organized desk situation with the 3-Drawer File Cabinet by UPLIFT Desk. Imagine having a workspace that has a place for everything and everything in its place. This is now possible with this rolling, locking file cabinet by UPLIFT Desk. Lock personal items safely within the cabinet's three drawers, giving you one less thing to worry about at work. And let's talk about portability. The 3-Drawer File Cabinet was designed to move wherever you need it, with locking casters to keep it in place once it finds its home. That means if you ever need to move to a different workspace, you don't have to unload your whole cabinet to do it. Get the secure storage your workstation deserves with the 3-Drawer File Cabinet, Rolling by UPLIFT Desk. If you have a buildup of desktop items that you rarely use or if you work at a standing desk without any storage, you could do well with a handy file cabinet that fits right under or next to your desk, right where you need it. At this time, this comes with three powder-coated color choices - black, gray, and white. We love the 3-Drawer File Cabinet because of its super secure, locking drawers. Hold valuables, store your purse, and keep sensitive documents locked away in one easy-to-reach spot. We're glad you asked! "What won't this hold?" is a more fitting question. Paper (legal and letter), folders, snacks, purses, photos, décor - you name it! You can fit it all within the three handy drawers on this mobile file cabinet. Does this come with file holders or bars? Yes, this file cabinet holds both letter and legal sized paper, and comes with removable hanging folder bars that can be inserted into the bottom drawer to adapt it to hold your folders. Do I have to assemble anything myself? Getting your cabinet assembled and set up is easy, all you have to do is attach the casters to the cabinet. Your box will come with a collection of screws and a small wrench for the job, which allow you to secure your wheels on tightly. Most users complete this step in just a few minutes. The 3-Drawer File Cabinet by UPLIFT Desk is available in three color choices: black, gray, and white. This mobile storage unit fits in well with the color scheme of your UPLIFT Desk. Store it under your UPLIFT Desk and banish desktop clutter for good. $259.00 List Price: $299.00* The list price is the same as the MSRP (Manufacturer's Suggested Retail Price). It may not necessarily be the price at which the product is sold.